The Gili Eco Trust will be the main beneficiary of this partnership to help the Indonesian islanders of the three Gili islands - Gili Trawangan, Gili Meno and Gili Air - cope with environmental stresses and threats. Singapore, 31 March 2011. Gaia Discovery is taking on a series of environmental projects in Southeast Asia, starting with coral gardening and assisted reef restoration programmes. It seeks the participation of scuba divers from around the world to join its scheduled group trips beginning 14 May 2011 (see below for full schedule). Biorock structures are built according to need and can withstand wave action. For a start, it has partnered with Big Bubble resort and dive centre to clean up the existing coral reefs and lay new ones at Gili Trawangan, Indonesia. Through this initiative, the island will have new coral reefs that will provide shelter for fish, encourage new fish growth, promote marine biodiversity and prevent beach erosion. The programmes benefit the island's fishing industry and marine tourism that are under threat due to environmental pollution, climate change and warming temperatures. “We have been reporting on the environmental outlook in Asia through Gaia Discovery with special interest on threatened marine environments. Going a step further, we now provide opportunities for people to care for marine environments through personal involvement and positive action,” said Mallika Naguran, publisher of Gaia Publications and Managing Director of Gaia Discovery Eco Solutions. Mallika, an environmental consultant and keen scuba diver, elaborated on the programme’s rationale. “Most of the time, scuba divers are warned not to touch anything underwater for fear of harming marine creatures or themselves. This contributes to a sense of helplessness even apathy towards the plight of corals facing stresses," she said. "Leisure divers don’t realise that they can get involved and not just watch corals and sponges being displaced by extreme weather conditions, smothered by algae, gobbled by predatory creatures like Drupella snails or damaged by irresponsible fishing methods,” Mallika added. Mallika hopes Gaia Discovery Reef Gardening & Restoration Programme will turn leisure scuba divers into reef gardeners and growers, and hopes to send the renewal message out to 1000 divers by 2012 end. Loose fragments of different coral species are collected for affixing on Biorock reef structures. The dive trip will include presentations on ecology, responsible tourism, marine protection, monitoring, reef gardening and restoration techniques involving Biorock. Scuba divers will be involved in the entire process of coral reef restoration – from the design and construction of a heavy steel frame structure, to laying it down beneath the sea where scattered broken coral fragments will be collected from the seabed and attached to the frame. 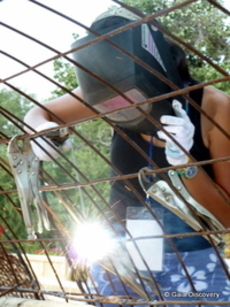 Participants will receive a PADI certification for completing the Biorock® Specialty Course. Corals are fragile animals. Coral reefs comprise less than a percent of the ocean floor yet they provide sustenance and natural habitats to nearly 25 percent of marine life. Reef collapse leads to fishery decline, depleting shoreline and reduced coastline buffer that in turn impacts negatively on beachfront properties, marine tourism, human lives and livelihoods. “The only interim solution is to use methods that greatly increase coral growth rates and resistance to environmental stress. Biorock® Technology is the only method that does so, and it is crucial to apply it in as many places as soon as possible, as these threats will get much worse in the coming years,” he said. Gili Trawangan has since 2004 resorted to drastic environmental measures to salvage its depleting coral reefs and eroding beaches and has to date put in place nearly 60 steel reef structures that form new marine habitats. Biorock involves passing a low voltage electrical current that helps fortify structures against rusting while increasing coral growth rate and resistance to environmental stress. This includes resistance to warming ocean waters that otherwise cause corals to bleach, a serious condition that would kill these marine creatures that are home and sustenance of many others. Reef collapse lead to fishery decline and less attractive marine tourism. Coral fragments tied to electric Biorock structures grow two to five times faster than usual. “We certainly can't save it all, but if we don't save all that we can, what will we have left?” said Dr Goreau, a renowned scientist who has been solving environmental crises with renewal methods for 20 years. Saving a part of marine life is Gaia Discovery’s mission. Some proceeds from these dive bookings go towards supporting Gili Eco Trust’ environmental programmes through the Gaia Discovery Restoration Fund. Gaia Discovery intends to take two groups: reef gardening activity involves 5 nights and 6 days while reef restoration programme will be held over 7 nights and 8 days, both starting from 14 May 2011. Further dive trips are planned following that as well. Interested parties and corporations intending to ride on these programmes for their CSR projects should contact Gaia Discovery for further enquiries and rates. To minimise its impact on the environment, the trip involves purchase of carbon offsets for flight travel, accommodation at fan-operated guesthouses and a no single-use plastic policy. The Gili Eco Trust was set up in 2002 to support local efforts from SATGAS (local security) to protect the three Gili islands. The seven dive centres of Gili Trawangan reached an agreement with a local organization and began collecting a small fee from each diver. Through the Gili Eco Trust Eco Tax, each visitor or diver continues to help to conserve its recovering marine environment and help with new eco projects. Visit http://www.giliecotrust.com. Big Bubble owns a resort, pool and dive centre on Gili Trawangan. Gili Trawangan is a tropical island located off Lombok in Indonesia. Visit www.bigbubblediving.com. Gaia Discovery is Asia’s premier online eco-tourism publication. It celebrates the eco life with readers from 100 countries daily www.gaiadiscovery.com. The Gaia Guide is an annual information guide on ecotourism. 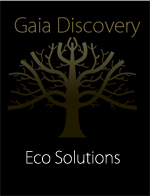 Gaia Discovery Eco Solutions helps businesses run sustainable operations and green events. www.gaiadiscovery.com/eco-solutions . Does not include airfare, airport transit/ferry, meals and night dives. Please enquire for more information.